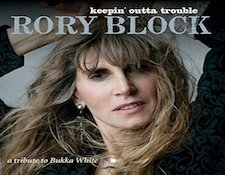 Artist: Rory Block - "keepin outta trouble - A Tribute To Bukka White"
Blues artist Rory Block seems to have a certain fondness for tribute albums, as "keepin" is now her sixth, this one being devoted to Bukka White. Her stated goal is to produce those works that memorializes artists who have had a profound influence on her career. This whole CD details aspects of Bukka White's life and track two, Bukka's Day talks about White going to jail and how the Blues is God's music. All throughout this CD Block's style is classic blues, much of which I'm sure Bukka White himself would have been pleased to hear. If the Blues in a 1930's Mississippi Delta style is liked and admired, then check out the new work from Rory Block - because that is exactly what this one is. 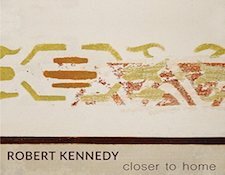 Artist: Robert Kennedy - "Closer To Home"
Sometimes the world needs more music that is centered around the magnificent Hammond B-3 organ. Anyone agreeing with that assessment should consider the second release by Robert Kennedy, an artist who is quite skilled at the B-3. Joined by guitar, saxophone and drums, the quartet of performers weaves their way through ten tracks of original and standards all done in a traditional jazz genre. Born in the South, Kennedy has made somewhat of a name for himself in the San Francisco Bay area where, surprisingly, the Hammond B-3 is seeing a resurgence of sorts. All ten of these tracks are done in a straight up, traditional, sometimes gospel, sometimes bebop, sometimes soul type of jazz presentation. 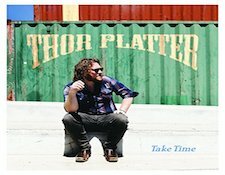 Artist: Thor Platter - "Take Time"
With a voice that has an eerie resemblance to Willie Nelson, "Take Time," Platter's latest release, is a collection of songs in a folk, blues, and country type of presentation. Platter himself has often said he just makes the music he enjoys. Most of the ten tracks contain all the hallmarks of what is stylistically folk based music - harmonica, banjo, and guitar. Platter cites performers like Woodie Guthrie, Bob Dylan and even Lester Flatt & Earl Scruggs as inspirations for his own particular style of music. In fact, Platter himself has been cited as saying that like his most profound influence, Neil Young, he has always been more concerned about how music was recorded. In fact, by Platter's own admission, he never wanted to be a pop star and his preference is what he terms as "Americana Music." From toe tapping upbeat, too soulful, soft and slow, Platter delivers a blues, folk work that will be enjoyed by any fan of the folk genre. 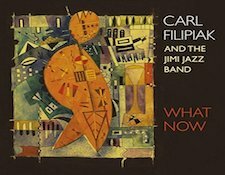 Artist: Carl Filipiak and the Jimi Jazz Band - "What Now"
When I read the CD's title my first thought was what the heck is a Jimi Jazz band? By the second track I realized that was basically a pointless question. What was of far more importance was actually listening to a remarkable jazz guitarist. He has been called "dazzlingly versatile" and has played with an impressive list of jazz artists and has been written up in publications like Guitar World, Jazziz, and Jazz Times. On "What Now," Filipiak delivers seven original tracks and one cover of the Beatles hit, "Strawberry Fields Forever." Beyond his guitar work, bass, saxophone, keyboards and drums in what I would not classify as necessarily traditional jazz, not especially smooth jazz, but more perhaps in line with fusion jazz accompany him. All in all, Filipiak is a very, very talented guitarist who is certainly worth a listen.